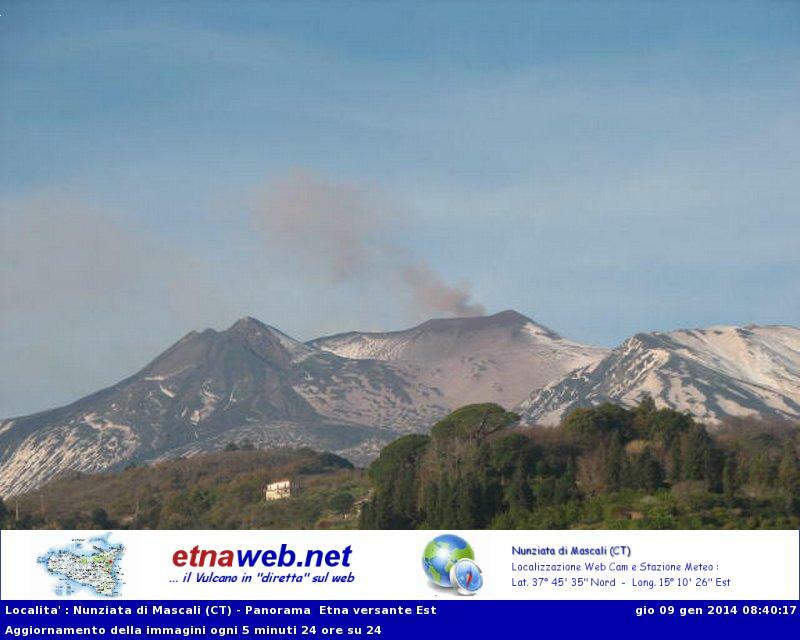 Etna (Sicily, Italy): The activity of the volcano has remained similar to the previous days: so far, relatively weak but more or less steady ash emissions are occurring at the North-East crater, and tremor continues its slow rise. Whether this is a precursor to more vigorous activity (from the New SE crater?) remains to be seen probably in the coming days. Shiveluch (Kamchatka): A series of ash plumes to altitudes around 20,000 ft (6 km) from the volcano were reported by VAAC Tokyo, suggesting that the lava dome is currently in a relatively active phase with frequent explosions and/or rockfalls / pyroclastic flows. Sakurajima (Kyushu, Japan): Following an unusually long interval with no real explosions, two small to modest vulcanian eruptions have again occurred on 6 January and today, with ash plumes reported to 10,000 ft (3 km) and 6,000 ft (1.8 km) altitude. Suwanose-jima (Tokara Islands, Japan): Occasional stronger explosions at the volcano produce dark ash plumes rising up to 1-1.5 km altitude. Marapi (Western Sumatra, Indonesia): The volcano (not to be confused with MErapi in Central Java) erupted again yesterday (Thu) morning, producing a series of small (probably phreatic?) ash explosions, with ash plumes that rose to a few 100 m above the crater. Pagan (Mariana Islands): Low-level unrest continued at Pagan during 27 December 2013-2 January 2014; seismicity remained above background levels. A robust steam-and-gas plume was occasionally visible in web camera images during the reporting period. A small explosion was detected at about 0145 on 28 December. Popocatépetl (Central Mexico): Volcanic activity remains low. CENAPRED only counts few (2-5) weak explosive emissions per day. Glow and continuous degassing still indicate that magma is being supplied to the crater, and justify the continued alert level Yellow Phase 2. Santa María / Santiaguito (Guatemala): Activity remains essentially unchanged. Small to moderate explosions are occurring at rates of 1-3 per hour, producing ash plumes that typically rise 300-600 m. Extrusion of viscous lava feeds several active block lava flows on the upper slopes of the Caliente dome. Their activity can be seen as near-constant avalanches. Pacaya (Guatemala): The volcano continues to be in mild strombolian activity at the Mackenney crater. Fuego (Guatemala): Activity remained elevated, but decreased a bit today, judging from the seismic signal. The volcano observatory reported moderate explosions with shock waves that ejected incandescent bombs to 200 m above the crater and left abundant incandescent avalanches on the upper crater. Associated ash plumes rose up to 1000 m and drifted 10 km before dissipating. The new lava flow towards the Ceniza drainage was 400 m long this morning.